Hi! Last time we posted we had just finished the Quilt Top for our Window Panes Custom Quilt and we are back to show you the finished quilt. 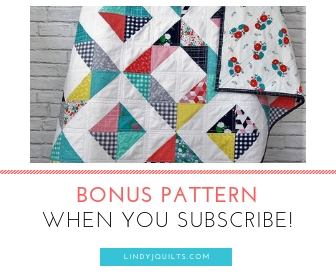 This quilt is an interesting variation of our Lottie’s Squares block. We used the same block we used in our Blue and White Lottie’s Squares toddler quilt and created “window panes” by orienting all of the half borders to form a frame around four 4” squares. Our source of fabric inspiration came mostly from Art Gallery Fabrics – a list of what we used is posted here. We adore the deer prints and the secret woodland creatures! We used about 20+ different modern prints in various blues, reds, creams, greens, and grays that coordinated with the Mammoth Plaid flannel back. Art Gallery fabrics have such a nice feel to them and when you put them all together, the quilt just drapes wonderfully. This quilt was bigger than our usual toddler/baby quilts, but we enjoyed the longer process. It took several days to cut the strips and squares, over a week to make our 4” blocks, and then a couple more weeks to get the top together! And pin basting was no joke, let me tell you! The quilting went fairly fast. We ditch-stitched all the seams and added another 1” of quilting on each side of the seam. Slow and steady, but it went fairly quickly. This quilt is very comfortable! The soft flannel backing added a little more weight to the quilt – it’s going to keep its new owners warm in their mountain home. We bound the fabric with a bright red Art Gallery Squared Elements and it was the perfect choice. The binding really pops and it frames the quilt beautifully. This quilt measures at 70” x 80”: (224) 4” squares framed on 2 sides by LOTS of 1” strips (Robert Kaufman Kona in Bone). It feels good to accomplish a big quilt, and we are looking forward to our next custom quilt order for a new baby. It’s much smaller and a completely different color palette – we’ll be posting on that soon! We are also spending the rest of December finishing up several projects so that we can start 2017 with a fresh clean slate! If you are interested in a custom quilt, feel free to contact us! Hope you are enjoying your December! Liked this post? Then read more! Next Post Clemson Tigers! A Finished Orange and Purple Toddler Quilt and a New Pattern!